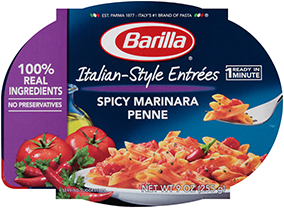 Barilla® Ready Pasta is an all natural, fully cooked pasta that's ready in the microwave in just 60 seconds. Made with 3 simple ingredients - a dash of extra virgin olive oil, a pinch of sea salt and "al dente" Barilla pasta - Ready Pasta has no preservatives and is non-GMO certified. Simply heat the pouch in the microwave then add your favorite toppings for a quick and delicious dish. Discover more in our Ready Pasta FAQs. Barilla Ready Pasta is made with non-GMO ingredients. For more information, please read our position.